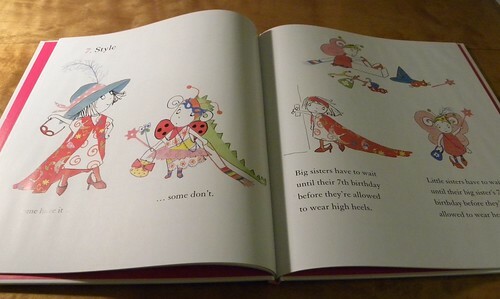 Quite frankly, I expected A Guide to Sisters to be a bit cute and a bit ordinary, the way so many picturebooks for little girls are. Cute is fine, but sometimes you want more. And you know what? Paula Metcalf has written a very amusing and unusual book, which is nicely – but not too cutely – illustrated by Suzanne Barton. There is a guide to tickling, which includes the tickliest body parts of your little sister (did I mention this guide is for the older sister? ), as well as showing the reader how to be comfortable while having a good grip on that little sister as you tickle. Little sisters are like a loaf of bread to begin with, but not one you are allowed to butter. Occasionally there are BOGOF sisters (=twins). They cry and poo and give you lovely kisses. And then they bite. Apparently you are not supposed to give them away, either. You will always be better than your little sister. You can cheat her out of almost anything if you do things right; ‘one for you, two for me…’ And if you play your cards right, she will tidy your room for you. But when all is said and done, they are not too bad, those little sisters. This entry was posted in Authors, Books, Humour, Picture book, Reading, Review and tagged Paula Metcalf, Suzanne Barton. Bookmark the permalink. I don’t remember getting either of them to clean my room, but I have to admit that at this point in life, having younger sisters is pretty great. I could send the instructions if you like. Basically you present the cleaning as a game, and they are awarded more stars the better and faster they do it. My mom tried something like this a few times but basically our perseverance in laziness proved stronger than our interest in stars.